The end of September hangs suspended between seasons. One day the balance tips towards summer, the next, towards autumn. This past week has been gloriously summer-ish, with golden light and warm days. 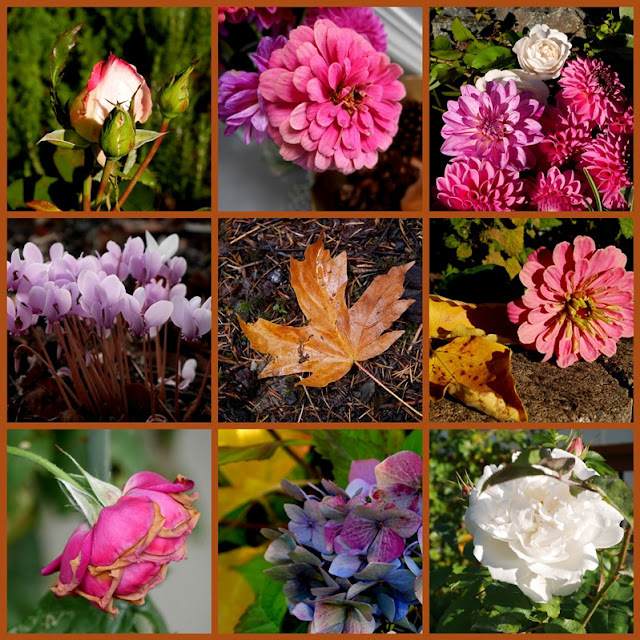 The garden shows the effect of waning sunlight and cool nights with burnished colour on leaves and flowers. The fig tree leaves fade to yellow and begin to fall. Dry oak leaves scuttle along the street, swirling up into the wind caused by passing vehicles. On Friday afternoon it was impossible to stay indoors. My grade 9 Spanish class begged to study outdoors. I promised them a short walk around the playing field if they would work at the beginning of the class. They agreed with alacrity. How lovely it was to be out in the sun with the students, watching them race ahead and fall back, reach up to pick a few remaining sweet blackberries from the bushes along the perimeter, laugh, and talk. A lone gull lords it over a flock of plovers on a rock nearly covered by the high tide. After class, I bought groceries and brought them home, then went out for a little walk. When Tim came home I suggested we go down to the water for a walk. At the breakwater, we saw three huge cruise ships in dock. While we watched, one left and another came in with a tiny tug nudging it into place. Barges, pilot boats, helicopters, float planes, a ferry, pleasure boats, and container ships came and went while the fiery sun sank lower and lower against the Sooke Hills and finally disappeared in a glow of orange. With the sun went the warmth and we made our way to the cafe at the breakwater for a simple supper of soup, salad, and a shared plate of nachos. Today, Saturday, the clouds have moved in and rain is in the forecast. Still the garden and woods show summer colour, juxtaposed against the tawny shades of autumn. Beautiful images. I love the light you have captured! So you are a Spanish teacher - I did not know! I love Spanish, read quite well but lack talking practice. Happy Sunday. Glorious images Lorrie - the words 'with the sun went the warmth' exactly describes how it felt for us yesterday. We had been out walking in the countryside, the sun was unseasonably hot, we shed our jackets, but as it faded away, suddenly the air became distinctly chilly. So lovely to see the last bits of colour in the end of Summer gardens. It wont be long before the garden is sleeping through Winter. Beautiful collage - and your day sounded perfect Lorrie. You do have a beautiful place to walk. Yesterday, still very warm, we did a few laps around the school track mid-afternoon close by - not exactly scenic but good exercise before light super and an evening sitting in the theatre! IT all sounds so, so beautiful. Wishing you a wonderful week my friend. What a lovely post. As I am typing my comment on this early Sunday afternoon, it is raining and dreary here. Right there with you as your descriptions are so fine and specific. It is a lovely season. How wonderful that you granted your students’ need to be out in the glory of it. It sounds idyllic the passing from one season to another in all its glory. How delightful to have enjoy Spanish class outdoors! Your flowers are lovely and a supper of soup, salad, and nachos sound perfect! Happy Mosaic Monday and a good week! Beautiful photos and post. You live in such a lovely place to have water near but not too close. Happy October! A lovely post and such a colourful mosaic. I think this time of year nature provides us with some wonderful colours. I recognize and relate to many of these descriptions - so apt for the season. All of my pots on the back deck have geraniums, but only one seems to be changing color due to the cooler temps. On my run through the woods today, aspen leaves crunched underfoot and made a lovely carpet! So glad you could make the most of this almost-summer weather to go to the café! we must enjoy while we can! Beautiful images of summers end, the mosaic is wonderful. Dearest Lorrie you are such a wonderful teacher and I imagine that you truly inspire your students. Your garden is magnificient. Your world is beautiful! I love teachers who "go with the flow" and go outdoors! These beautiful days at the beginning of Autumn are so wonderful. How good of you to let your students take advantage of the sun -- knowing there won't be too many more days like that this year. Spontaneous suppers out after a lovely walk -- one of our favorite ways to end a day too! What a thoughtful teacher you are, Lorrie, to grant your students some time to just BE outside! I'm sure you all loved it, and it refreshed all of you. You and Tim enjoying some time outside and then a simple meal sounds like a wonderful ending to a great day. You sound like a wonderful teacher, Lorrie, to grant your students a walk out in the fresh air. You have captured some lovely shots and the walk along the water with a simple supper afterwards sounds just splendid to me. I love spontaneous walks that end in eating a meal together down by the water! Nothing like it. Wishing you and your loved ones a very Happy Thanksgiving next week! Thank you so much for sharing your world with us. I very much enjoyed visiting. Here in Western Australia we are tipping between winter and spring - one day winter - one day spring. It has been so cold I look forward to the sunny days ahead. Enjoy the rest of your week and thank you for stopping by my blog this week. The weather has indeed been a very gorgeous autumn for strolling outdoors. Your flowers are soooo beautiful! They speak of Autumn or Fall. And a lovely simple dinner out sounds just lovely. I think if I saw the cruise ships I would want to hop on one and go venturing. Wonderful photos - and now the beginnings of Autumn. The leaves are turning and the days are cooler - but the days that are sunny are glorious. Time for soups and stews. Gorgeous photos, dear Lorrie. We have been enjoying rain for the last week and in fact we got snow up in the high country last night. The forecast is calling for snow here on Monday. I guess it's goodbye to the leaves as they have been slowly falling from the trees. Have a blessed Sunday! Hugs! 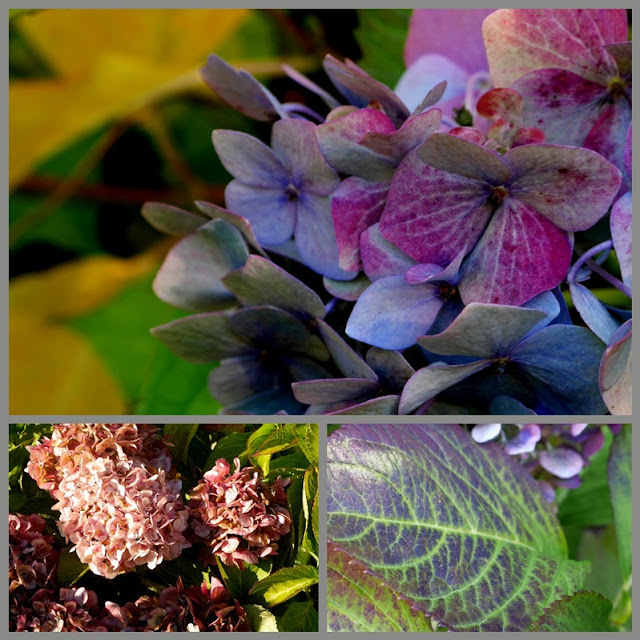 Beautiful, simply beautiful, my hydrangeas have finally bloomed after lingering all summer. Thanks for sharing.